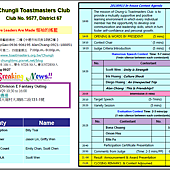 Meeting Minute - 2015/07/31 - Regular Meeting! 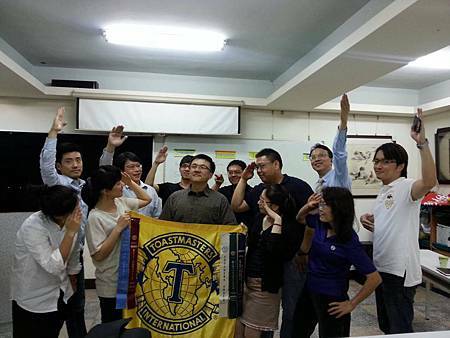 It was a successful TM meeting with New Member Introduction on the 31st of July. 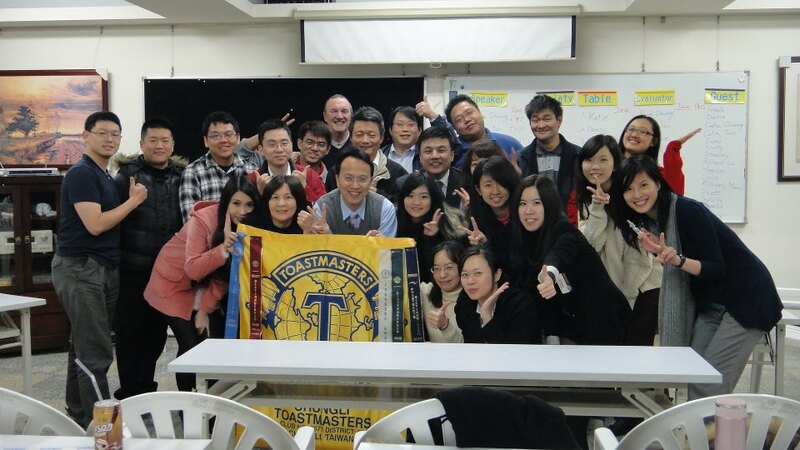 The meeting theme was Club President. 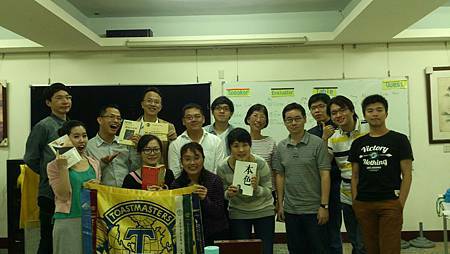 It was not only successfully introducing the assignment takers but also drew a lot of precious opinion for the future development of Chungli Toastmasters Club. There was slight change at meeting. 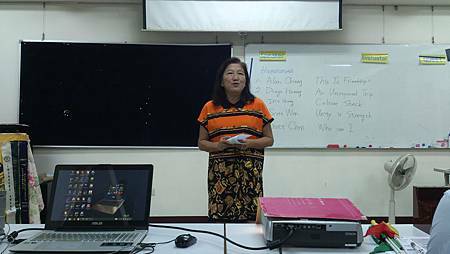 Helen Ding successfully conveyed the Table Topics Session in Variety Session. 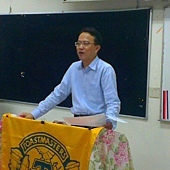 The topics were also creative and related with the upcoming Father’s Day. Charles Chen, first time Grammarian at TM, suggested use of sentences which can be visualized. 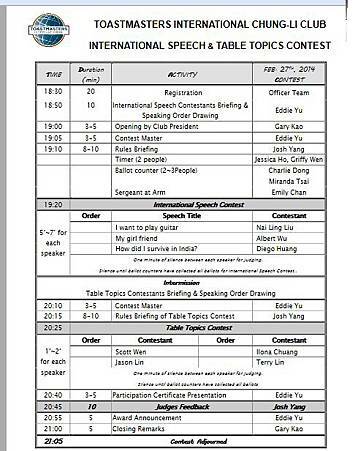 Faylinn Su delivered her C1 speech on her day. Orson Hsu who served as GE prepared a special gift for her Ice Breaker, ice beer. Ron Hwang did his first time assignment as an Ah counter, 5 starts performance, well done. Our long-lost friend Terry Lin came to help as Oscar’s IE. 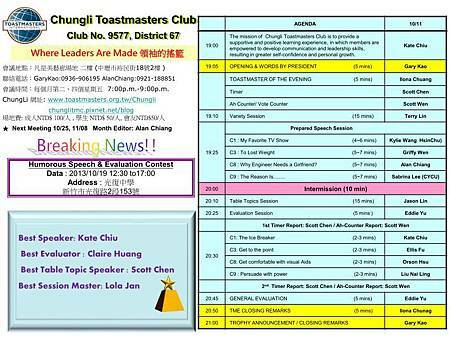 Speical guest Rojer Chen , from YZU TM also helped us as Vicky’s IE. Besides, we got visitors : Michael who just moved to Chungli from Taoyuan, Stella from Tainan and working in Guanyin(觀音), Eric , a Chunglider (中壢人) boyfriend of Stella, who are all friends with Oscar, Linda and Derek who have visited the meeting for few times. Finally, all visitor gave positive feedbacks, such as , an interesting place to visit, having a lot of fun, learning precious delivering speech techniques , gaining language skills, etc. The weather was nice, not too cold, nor too hot. It's a perfect weather for a TM meeting. 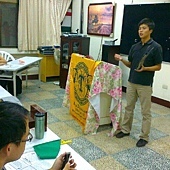 Tonight our TME Albert announced that the meeting theme was "simplicity", he brought us a different style of the meeting. He used less than 10 words to introduce every assignment taker, and speaker. We learned that "treasure our words, to be more precise and accurate about what we said. It was cold, drizzling. And it's Valentine's Day and Lantern Festival. 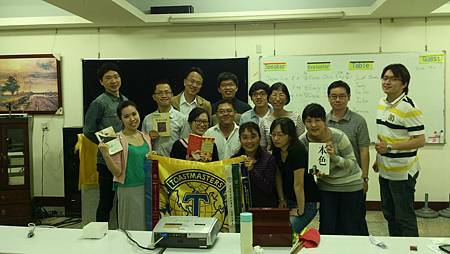 A group of passionate Toastmasters, we, Chungli Toastmasters Club were having an unusual regular meeting. 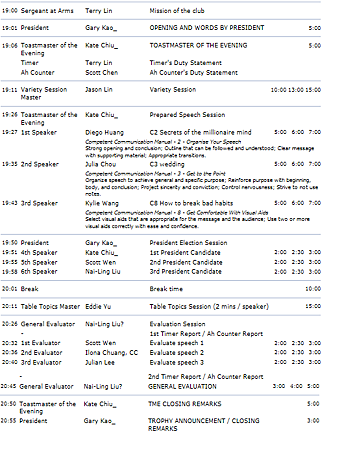 Our EVP managed to produce a "creative" agenda with an unusual TM meeting style. It was a super relax dinner meeting. In this BIG day, we managed to have fun, to have foods on the table, while we were able to learn something. It was a comfortable night; it was neither hot nor chilly. But where’s everybody? The meeting started late. President Gary gave us a good thought, he talked about it’s close to the end of year, what else we haven’t accomplished in terms of our new year’s resolutions in the beginning of the year. 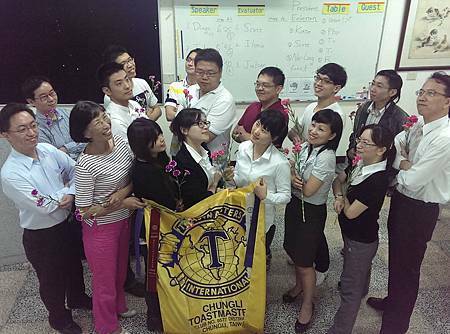 Toastmaster of the evening was still Emily, our beloved Division E governor, she demonstrated the spirit of service by serving as TME in 2 consecutive meetings. Two important helpers of the meeting were Charlie, our new member, he served as a Timer; Griffy, a new father, served as an Ah-counter. After President Gary’s warm welcome, Ilona hosted the meeting. 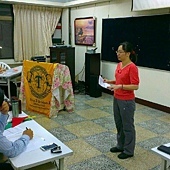 It was her second time to be a Toastmaster of the Evening. 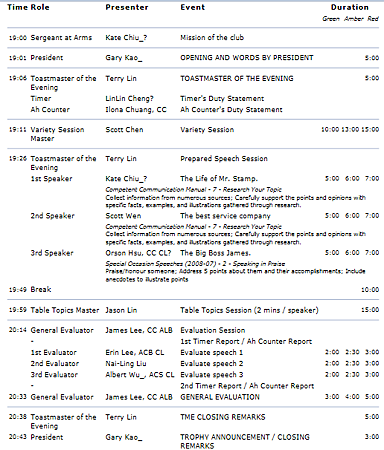 First session was a warm up session, hosted by Terry, our PRVP, who just organized a successful event—Division E outing. He played a game, when we guessed the correct word, and we could get the chance to draw a piece of paper from a paper bag, the paper would show the winning points. At the end of the game, team A beat up team B. It was indeed an interesting and exciting game. The atmosphere was a little bit of frozen, nervous, and even a little bit serious. The venue was unusually quiet(what? Chungli club was quiet??). Yet, we couldn’t take our eyes from those sparkling stars…. We saw stars were everywhere in the venue….. So many stars were in our in-house contest on Sept 13. It feasted not only for the eyes….but for the ears. The superstar of the night was Caroline the Lt. Governor Marketing from District officer team, who received DTM in 3 years and 3 months. Wow, we were lucky to have her to be the Chief Judge in this in-house contest. 9-Aug was definitely a memorable day; we had an irregular regular meeting! The meeting theme was “Sunday”. 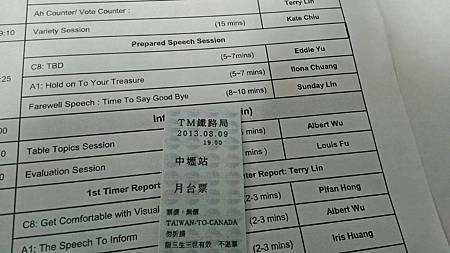 Each of us got a special “train ticket”, the train would take us from Chungli to Canada. How much would it cost? It’s priceless. What about its duration? It lasts forever. It is not refundable. Because our friendship are not valued by money, wherever you are, you are one of us. Therefore, no refund is accepted, once you got that magic ticket. Shortly after president Gary’s introduction, the knock-door prince Orson(who said that he was still single and available??) opened up the meeting with a song-“Beautiful Sunday”, all of us sang as with him. The song was dedicated to our beloved sunshine Sunday. 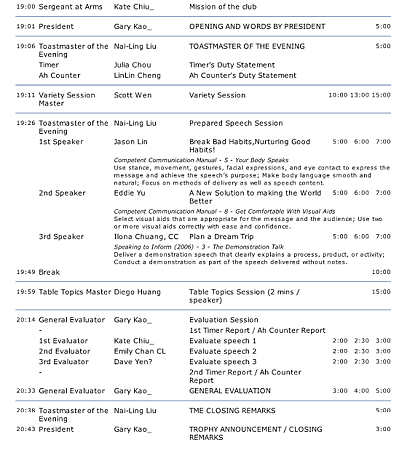 Orson was thoughtful to provide each session master and speaker a chance to say something to Sunday. The first time to be Acting President, without Amy control, I really felt responsible for the whole meeting -- the pledge sheet of Induction Ceremony, ballots and winner certificates . You couldn't believe it that we had 14 guests ,almost 30 persons smoothly around the meeting and Ryan also decided to join Chungli Club. How wonderful.